Earlier this month, I had the honor of attending the second Newborn Screening in Morocco Workshop, which tookk place at the School of Medicine and Pharmacy in the city of Fes. It is an amazing city that was founded in the 9th century and features an old city (or medina) that is the largest car-free urban area in the world. One of the world’s first universities was founded in Fes, and it is a center of arts, education and culture. These days, public health officials are establishing screening programs for newborns in the slightly-larger-than California-sized kingdom. Newborn (or neonatal) screening is the process of identifying inherited disorders within the first few weeks of a baby’s life so that treatment can be started early and have the greatest chance of success. It is a public health measure that can improve the lives of a significant number individuals and their families. Screening can also have an economic impact by reducing the burden on the healthcare system. Morocco is working to make screening more accessible to its population. 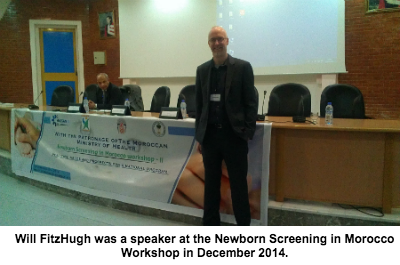 The first Newborn Screening in Morocco Workshop took place in Marrakech in 2006, and since then they have engaged in pilot efforts to test for several diseases in a few regions of the country. The workshop featured speakers from Morocco, Europe, the Middle East, and the United States who talked about their challenges and successes in setting up programs in a variety of situations. On the first day, I gave a talk about software applications and information technologies that are used to facilitate research in neonatal screening, including long-term patient follow-up. 5AM works with the American College of Medical Genetics and Genomics (ACMG) on the Virtual Repository of Dried Blood Spots (VRDBS), a secure system that allows approved researchers access to dried blood spots (DBS) from participating States. 5AM is also working with the ACMG on a new version of the Longitudinal Pediatric Resource (LPDR). LPDR is a secure informatics system designed to enable enhanced data collection, sharing, management and analysis for conditions identified as part of newborn screening or for conditions that may benefit from those screens. In addition, I talked about data exchange standards such as HL7 and FHIR that can be used to facilitate health information exchange (HIE). HIE is critical for both research and long term followup, since neonatal screening results need to be integrated with other patient data to provide an useful platform for research and to enable follow-up. Lastly, I talked about the implications of whole genome sequencing in the newborn screening field. The NIH is funding several pilot efforts to explore the use of next-generation sequencing in screening, to address questions about accuracy, impact and the attitude of patients. It seems pretty clear that sequencing will be part of newborn screening at some point, although there will no doubt have to be a lot of standards put in place to make sure it is used effectively. Photos courtesy of Will FitzHugh.